I’ve been working on a web application and one of the frustrating bits is wanting to test on multiple versions of Internet Explorer but knowing the computer can only hold one version at a time. Typically what I’ve done in the past is have IEx on my desktop and IEy on my laptop so I can test in at least two versions. 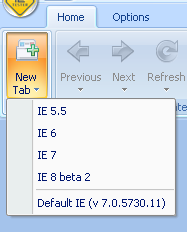 Last week I learned about IETester which is an application that allows you to test in IE 5.5, 6, 7 and 8 Beta. When you load IETester, you select which version of Internet Explorer to run that tab in. And you can have multiple tabs with different versions in each. It’s one of the most useful Web developer applications I’ve used in a long time.